Behind the heated discussions about ways to solve the issue of refugees flooding into Europe, the redistribution of oil markets and the prospects for resolving conflicts in the Middle East, it is not always evident that these issues are very closely linked. Yet in 2015, Europeans found themselves at the epicentre of geopolitical and geo-economic games being played according to other people’s rules and serving interests alien to Europe. The first and probably the most important element in this web of problems is the struggle for energy resources, which has escalated dramatically. Hidden behind the seemingly paradoxical unwillingness of OPEC members to reduce oil production, despite the continuing fall in world prices that have already reached an 11-year low, is the intention of key players to radically reformat the entire energy market. Their plan is to keep prices low for as long as possible, during which time they will strengthen their positions in the world oil market and then compensate for fiscal losses by rebounding the prices back up. The main players in this oil business are Saudi Arabia, Iran and Iraq. The very countries, in other words, that are actively involved in the conflicts in the Middle East, primarily in Syria. It is these countries that began the fierce battle for the redistribution of market shares, and Saudi Arabia has already put the balance of its state budget and a number of large-scale national investment projects, including the construction of a metro system in Riyadh, on the line. 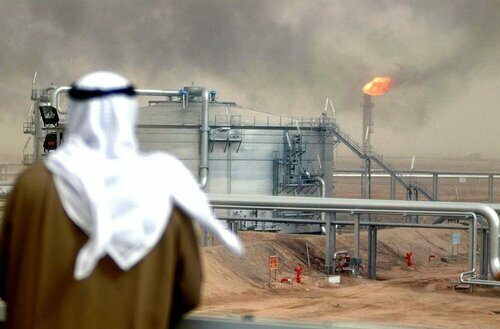 The main threat to Saudi Arabia’s position in the oil markets is from Iran, which is getting ready to increase its oil exports once sanctions are lifted and strengthen its relationship with China as a major consumer of energy resources. Taking advantage of the low prices, China is currently seeking to increase its strategic oil reserves as much as possible. Tehran has already promised to increase oil production following the lifting of sanctions by at least 500,000 barrels with an eye specifically on the Chinese market. According to sources in the West, the Chinese company Sinopec, the biggest buyer of Iranian oil, has extended existing contracts into 2016, while its competitors from PetroChina and CNOOC have, for their part, held talks with Iranian representatives with a view to drawing up their own contracts. One can also expect the conclusion of major contracts for the supply of Iranian oil to India. As things currently stand, Saudi Arabia’s room for manoeuvre is narrowing significantly. The only way for Riyadh to combat Tehran’s active expansion in the oil market is to reduce oil prices even more and offer discounts to its buyers. However, this, in turn, could further undermine the revenue side of its national budget, while Iran’s entry into the oil market will also make it more difficult to increase prices later on. The situation is complicated by the fact that Saudi Arabia, Iraq and Iran are producing almost the same oil, have the same target markets and use the same trade routes. The rapid deterioration of relations with Iran initiated by Saudi Arabia fits in nicely with Riyadh’s oil strategy, but conflicts like these have a habit of developing according to their own rules, destroying original plans and spinning out of control. It is interesting that University of South Florida Professor Mohsen Milani spoke of the inevitability of a conflict between Saudi Arabia and Iran back in 2011, basing his opinion, among other things, on the fact that both countries are «major oil producers». According to reports, oil is also playing a role in the conflict between Turkey and Iraq caused by the deployment of Turkish troops to northern Iraq. Significantly, Iraq is currently much more in favour of reducing production than the other OPEC members. At present, Iraq produces 3.8 million barrels per day, but plans to reduce this figure to 3.6 million barrels over the course of the year. In addition, Iraq’s oil revenues have fallen from $8 billion per month at a cost of $90-100 per barrel to less than $3 billion at the current prices. Iraq is convinced that the persistence of a number of countries in maintaining a high level of oil production is only doing harm to all the oil-producing countries. The current situation risks further destabilising events in the Middle East and could have a negative impact on European affairs, both in terms of new waves of refugees and ensuring the continent’s energy security. As a result, it is reasonable to expect new developments in the attitudes of Central and Eastern European countries with regard to the implementation of Russian gas projects. Senior Researcher, Institute of Slavic Studies. Will Muslim Migrants Stop the Depopulation of Europe?